We ship by USPS First Class or Priority Mail. Free Shipping on orders over 25.00. USPS shipping confirmation slips are placed on every package. Shipping confirmation shows when the package was shipped and when it has arrived. Flies or Products can only be returned if flies have not been used, and within 30 days of purchase. Buyer pays for return shipping. 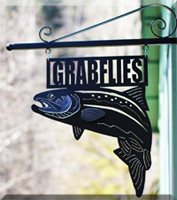 All information gathered on this website is used only by GrabFlies.com for processing orders and for answering your questions. We do not share any of your information with any third party partners.